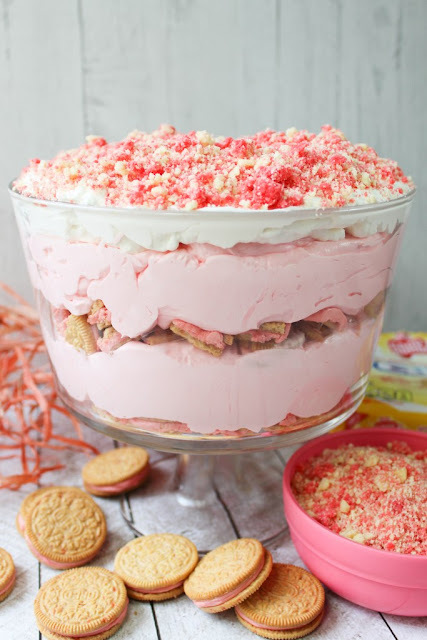 Good Humor's Strawberry Shortcake Bar turned into a trifle! Layers of NEW strawberry shortcake Oreos and creamy strawberry pudding topped with a tasty crumb topping. Simply sweet and perfect for summer dessert fun. In a small bowl, combine the strawberry gelatin mix, 4 tbsp butter, and 1/2 cup of flour. Using a fork, mix the ingredients until a crumble forms. The mixture should look uniform. In another bowl, repeat the same steps with the vanilla pudding. Spread both crumbles onto a parchment lined baking sheet. Bake at 350 degrees for 10 minutes. Check half way through to make sure it doesn't burn. Let the mixture cool completely and then mix it slightly to combine the flavors/colors. In a medium bowl, whisk the milk and pudding mix for 2 minutes and set aside. In a large bowl, beat the cream cheese, butter, and powdered sugar until smooth. Stir in the pudding mixture until well blended. Fold in the whipped topping until fully incorporated. Place half of the cookies in a trifle dish and then top it with half of the pudding mixture. Repeat the layers. Place in the fridge while you make the whipped cream. In a bowl with a mixer beat the heavy cream until it starts to thicken and bubbles form. Add in the powdered sugar and vanilla. Continue to beat until stiff peaks form. Spread the trifle with all of the whipped cream, and then top that with the strawberry-vanilla crumbs. Recipe for topping mixture by Deliciously Sprinkled. You will have leftover crunch topping which you can use later on ice cream or pudding! 0 Response to "GOOD HUMOR STRAWBERRY SHORTCAKE OREO TRIFLE"